This sections provides information to secure a meeting with a potential hiring manager both on the phone and via email/social media. What to say on the phone, once you are put through to the ‘right’ person! When speaking to the potential hiring manager, if you’ve been referred. This is to the point, friendly yet assertive. If the contact agrees to meet you, send a confirmation email of the date and time and thank them for talking with you. If they refuse to meet you, ask if they know anyone else that may be in a position to offer their insights. Mention any competitors, suppliers or customers you know. If you get knocked back, don’t worry its not anything personal, they don’t know you. They are probably busy. Do not get discouraged and stop making calls. The next person may be the person who has a job. If you stop digging, you are not going to find gold. Gold is what you will find with perseverance. When speaking to a potential hiring manager, you don’t know! First find something in common. Google the person you wish to contact. If they are a tennis player and so are you – there’s a common interest. If they are a member of the same LinkedIn group or they know someone you know – there’s a common interest. If they studied the same degree or went to the same university or worked in the same company or industry – there’s a common interest. Find something that you can use in your introduction to them. See below for an example script. What to say when you don’t know the person you want to connect with & you have been unable to find something in common. Use a similar approach to the above, however, try flattery and appeal to the person’s ego. After you have delivered whichever introduction you select. You might be asked who you are and what you want. When asked this be honest. Tell the person you are looking to learn more about either the job, or the industry and the best way to do that is from people in the field. If they ask where you are calling from, say you aren’t calling from a company, this is independent research. If they ask, “Are you looking for a job”? You response is, “I am only looking for information to help me better understand (insert the type of role you are looking for) or the industry”. Tell them you understand their time is valuable, which is why you are happy to buy them a coffee and limit the meeting to 20 mins/30 mins (insert what feels right). When contacting a potential hiring manager, if you’ve been referred. The manner in which you contact someone on-line is very similar to the approach you would take when phoning someone directly. Jill Taylor suggested I connect with you, as she tells me you are an Advertising expert. I am currently researching opportunities for Account Directors in Advertising and wondered if you would be open to spending half an hour with me talking about your industry and where you see trends? Your opinions and insights will greatly help me to get some ideas where I should be focusing. I realise you are probably very busy so I am happy to fit in with you any time in the next two weeks. I will only take up half an hour of your valuable time. My contact details are below. Please email or call to let me know what time suits. If I haven’t heard in a few days, I’ll reconnect as I guess you will be busy. Thank you in advance, I do appreciate that you will be doing me a favour and I hope to be able to reciprocate down the track. 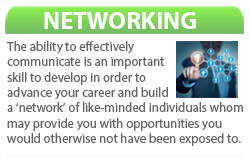 Find a target contact and connect on LinkedIn. Send them a connect message, such as the one above. Now that you have their details, you can either send them a follow up email or call them directly. Use groups in LinkedIn to find potential hiring managers for you to connect with. For example, if you are looking for a Financial Accounting role in Retail, search for groups such as CFO’s or Retail. Start your search as broad as possible then narrow it down using the features in LinkedIn. 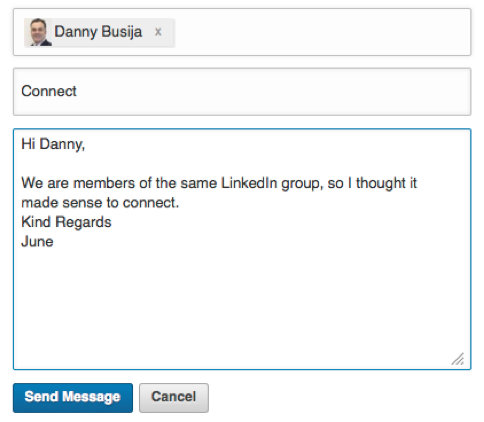 Never send the standard LinkedIn connection. Always tailor your message. Be aware the mobile version of LinkedIn, sends standard connections, so its best to connect via your PC, not your mobile device.